Title: 03/12/1993 - Iron oxides as used in pigment coloring operations. Thank you for your letter of October 26, 1992 that requested clarification on the hazard classification of iron oxides, as used in pigment coloring applications. OSHA's Hazard Communication Standard (HCS) 29 CFR 1910.1200(d)(1) requires that chemical manufacturers and importers evaluate chemicals produced in their workplaces or imported by them to determine if they are hazardous. Employers are not required to evaluate chemicals unless they choose not to rely on the evaluation performed by the chemical manufacturer or importer for the chemical. The hazard evaluation is a process which relies heavily on the professional judgment of the evaluator, particularly in the area of chronic hazards. The performance- orientated approach of the hazard evaluation does not diminish the duty of the chemical manufacturer, importer or employer to conduct a thorough evaluation, examining all relevant data and producing a scientifically defensible evaluation. OSHA's compliance directive, OSHA Instruction CPL 2-2.38C, "Inspection Procedures for the Hazard Communication Standard," states that any substance with a specific OSHA Permissible Exposure Limit (PEL), regardless of the health effects, is covered by the HCS and an MSDS and label must be developed and transmitted downstream by the chemical manufacturer, distributor or importer. This is consistent with the requirement in the HCS that any substance with an OSHA PEL be considered one of a "floor" of hazardous chemicals covered under the HCS. An OSHA PEL has been established for iron oxide (dust and fume) [see Federal Register Vol. 54, No. 12, enclosed], and therefore an MSDS and label must be developed and transmitted by the chemical manufacturer, distributor, or importer. Get signs to mark the location of hazardous chemicals as well as MSDS supplies at Safety Emporium. The toxicity of iron oxide in humans is conflicting. However, "McLaughlin, whose opinion on the subject is widely accepted, believes that the presence of iron oxide dust or fume in the lung causes pigmentation (termed siderosis) that is responsible for the changes seen in exposed individuals' chest x-rays" [FR Vol. 54. No. 12]. Additionally, "OSHA believes that any occupational exposure that causes foreign substance to lodge in body tissues is undesirable" [FR Vol. 54. No. 12). We realize the FDA has granted approval to iron oxides for use as a food colorant. However, their approval is based on evidence indicating no adverse health effects at concentrations associated with its use as a food additive. FDA approval of iron oxide as a food colorant is not entirely relevant to occupational exposure from iron oxide. In general, occupational exposures are higher in concentration, of longer duration, and at greater frequency. Therefore, it is inappropriate to conclude that FDA approval, as an approved colorant, is evidence that iron oxide dust is not hazardous. 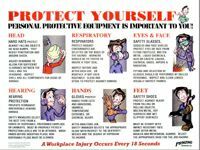 Safety posters are a terrific way of reminding employees of proper procedure. Get yours at Safety Emporium. While chemical manufacturers are required to evaluate the hazards of chemicals they produce; the mere presence of a hazardous chemical in a product does not necessarily result in coverage under the HCS. It must be available for exposure. Employee "exposure" is defined by the HCS to include any route of entry (inhalation, ingestion, skin contact or absorption) and also include potential (e.g., accidental or possible) exposure, including foreseeable emergencies. For example, employee exposure to iron oxide occurs during the manufacturing processes associated with iron oxide (powder, ore). To meet the HCS's requirement, a hazard evaluation of iron oxide (powder, ore) must include a thorough assessment of both physical and health hazards. Additionally, it is OSHA's established policy that "the chemical manufacturer or importer must consider the potential exposures that may occur when downstream employers use the product and address the hazards that may result from that use on the label and MSDS prepared for the product. Only by considering all these factors can the chemical manufacturer or importer accurately evaluate the hazards encountered during the anticipated use of the product" [see FR Vol. 52, No. 163, Appendix B; and CPL 2-2.38C p. A9, enclosed]. We hope this information is helpful. If you have any questions please contact us at (202) 219-8036. Enclosed are the November 6, 1992 DCMA comments submitted to Mr. Charles Adkins, Director of Health Standards Program DOT/OSHA supporting the classification of iron oxides, as used in pigment coloring applications, as non-hazardous. Please contact me if you need further information. I will await your reply concerning the status and/or response of the November 6, 1991 DCMA comments. Thank you. Enclosed are comments of the Dry Color Manufacturers' Association in support of classifying iron oxides, as used in pigment coloring applications, non-hazardous pursuant to OSHA standards and definitions. This concerns a matter originally brought to the attention of OSHA in a March 3, 1991 letter to Mr. Ira Wainless from Mr. Douglas P. Kelly of Mobay Corporation, and a follow-up letter of April 30, 1991 from Mr. David Hackathorn of Mobay Corporation to you. Please let us know if you have any questions concerning this.